Romance Reader at Heart Loves JUDAS KISS! Whew! JUDAS KISS vibrates with such energy, it maybe could single handedly fuel electricity to New York City for a day. The third in the Taylor Jackson series provides such an adrenaline rush, readers may feel drained by the last page as well. JUDAS KISS takes readers on a spectacular twisty, unrelenting chilling ride full of unexpected surprises. J.T. Ellison definitely has a keen sense of suspense. The mega talented Ms. Ellison not only gives readers an incredible thriller, she has created a truly fantastic female character in Taylor Jackson. In JUDAS KISS, Taylor's mettle is put to the extreme test as she deals with a puzzling murder, an unsavory surprise from her past, a sanctioned assassin turned serial killer who is after her as well as another serial, The Pretender—part of a deadly duo from 14—who keeps lurking in the background. Instead of cluttering JUDAS KISS with too much baggage, Ms. Ellison smoothly dovetails these four seemingly unrelated elements into non-stop excitement. JUDAS KISS also delves deeper into the normally unflappable Taylor Jackson, showing a more vulnerable side. Likewise, more insight is given to Taylor's fiancee, super FBI agent John Baldwin. These two characters balance each other so well, are so attuned, so connected, their relationship adds another intriguing layer to the Jackson series. J.T. Ellison is terrific. This relative newcomer is on her way to becoming a major star in the suspense genre. Her timing is flawless, her characters are full-bodied, her storylines are wonderfully convoluted. And creepy. If you haven't read Ms. Ellison, I strongly recommend her Jackson series. JUDAS KISS continues the brilliance. NASHVILLE, TN—December 15, 2008—MIRA Books announced today that J.T. Ellison, Nashville resident and acclaimed author, will release the mystery/thriller, JUDAS KISS in January 2009. JUDAS KISS is the third novel in the critically acclaimed Taylor Jackson series, which includes ALL THE PRETTY GIRLS, 14, and the forthcoming EDGE OF BLACK due out in September 2009. Ellison will kick off her book tour with a personal reading and book-signing at two Nashville area book stores. On Wednesday, January 7, 2009 at 11:30 a.m., Ellison will be at Sherlock Books, located at 200 Maddox-Simpson Parkway, Lebanon, TN 37090. On Thursday, January 10, 2009 at 7:00 p.m., she will be at Davis-Kidd Bookstore located at 2121 Green Hills Village Drive, Nashville, TN. 37205. Ellison will be joined at both events by fellow author Laura Benedict, author of CALLING MR. LONELYHEARTS. All of the books are available at all bookstores as well as internet sites such as Amazon.com. 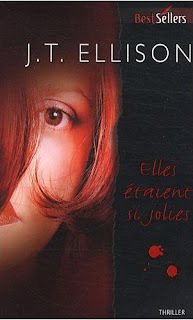 In addition, ALL THE PRETTY GIRLS has been translated into French and 14 is in the process of translation. Both books have been released in Australia. As the details of a gruesome murder emerge, the city of Nashville is shaken by the grisly images—a bludgeoned victim, a crying child and tiny bloody footprints scattered throughout the house. Homicide lieutenant Taylor Jackson discovers, however, that this victim’s seemingly perfect suburban lifestyle has a dark underbelly, one full of dark desires and fetishistic deeds—which connect all the way to the lieutenant herself, threatening to destroy her personal and professional life forever. JUDAS KISS (MIRA Books, January 2009, $6.99 U.S./$6.99 CAN.) is the third book in the Taylor Jackson series, following All the Pretty Girls and 14. J.T. ELLISON is the author of the critically acclaimed Taylor Jackson series, including ALL THE PRETTY GIRLS, 14, JUDAS KISS and the forthcoming EDGE OF BLACK. She was recently named “Best Mystery/Thriller Writer of 2008” by the Nashville Scene. J.T. Ellison is a graduate of Randolph-Macon Woman’s College and received her master’s degree from George Washington University. She was a presidential appointee and worked in the White House and the Department of Commerce before moving into the private sector. As a financial analyst and marketing director, she worked for several defense and aerospace contractors. After moving to Nashville, Tennessee, Ellison began research on a passion: forensics and crime. She worked extensively with the Metro Nashville Police, the FBI and various other law enforcement organizations to research her novels. Ellison was mentored by one of her literary heroes, best-selling author Lee Child. She lists Child, John Sanford, John Connolly, Erica Spindler, Tess Gerritsen, Alex Kava, Jeff Abbott, Tasha Alexander and Michael Connelly among her favorite authors. Ellison’s short stories have been widely published, including "Prodigal Me", featured in the anthology KILLER YEAR: Stories to Die For, edited by Lee Child, from St. Martin's Minotaur. Currently, she is the Friday columnist at the Anthony Award nominated writer's blog Murderati and is a founding member of Killer Year, an organization promoting the debut novelists of 2007. MIRA Books™ is Harlequin Enterprises’ mainstream women’s fiction imprint. Featuring a lineup of some of the bestselling authors across North America, MIRA Books is committed to publishing the very best in commercial fiction, from historical and contemporary romance to suspense and psychological thrillers. In 2007, 36 of our titles placed on bestseller lists (New York Times, USA TODAY and Publishers Weekly). MIRA Books currently publishes over 100 books per year in hardcover, mass-market and trade paperback formats. Please see the MIRA Books Web site—www.MIRABooks.com—for more information. JT Ellison's 14 (Mira, $6.99) holds up against any top drawer suspense novel. The title refers to the number of people slain in the serial killings. Troubling, though, is the fact that 10 of the murders were committed in the 1980s by an unidentified serial slayer designated as "The Snow White Killer." When an additional four bodies, replete with the serial killer's signature, appear now, the question is whether the long dormant Snow White killer has returned or whether the recent murders are the handiwork of a similarly depraved copycat. Nashville Homicide Lieutenant Taylor Jackson lands and solves the case, but not without chilling challenges along the way. You won't want to read this when you're home alone at night, but you will want to read it. Merci beaucoup to Philippe Mortimer for translating my work. Ellison has a flair for the macabre shared by few writers, and her latest is heartily recommended to anyone who enjoys a scary-good mystery and/or a strong female protagonist. The murder of Corinne Wolff is horrifying on many levels. A well-off, happily married mother who was expecting a second child, she seemed to be living the American dream. Suddenly, she's the victim of a violent assault, and her daughter's left alone with her corpse for at least 36 hours. Who'd do such a thing? Homicide lieutenant Taylor Jackson and her team have to find out. Their attention turns to Corinne's husband, Todd, who claims he was out of town on business. Certain elements of his story don't add up, but the evidence suggests his crimes are of a different nature. Taylor's stymied and distracted by a number of things: the absence of her fiancé, FBI profiler John Baldwin, and the distinct feeling that she's being watched. The two are connected in a way that she can't imagine - and that's not the only peril she's facing.